Ah yes, the glorious 1950’s when choosing a Geiger counter was part of every boy’s right of passage. People may not remember their first kiss, but they sure as hell remember their first multi-tube scintillation counter. Rate meter? Multitube counter? Scintillation counter? Here an expert advises you on how to buy a uranium-finding instrument. HUNTING uranium with a Geiger counter is like stalking game with a well-trained hound. All of the hundred-odd kinds of uranium ore are radioactive, and hardly any other rocks are. So a counter’s ability to “see” radiation can lead straight to pay dirt. Counters are the great equalizers of the uranium rush. Thev give a tenderfoot an even break with trained mining men. and account for rank amateurs’ successes in history’s greatest metal hunt. You can pay from about $20 to $2,000 for a counter, and choose from dozens of models. Which will best suit your needs? What counters do. Counters differ in performance and price much as cameras do. Both are receivers of radiation. A counter’s “lens” consists of one or more Geiger tubes, or a scintillation crystal. Like a big-lensed camera, a counter with a large receptive element can receive a great amount of radiation in a short time. In a camera, this permits good pictures in weak light; in a counter, it enables you to detect weak or distant radiation. And it makes both camera and counter expensive. If a camera hasn’t a big lens, you can make it receive more radiation by leaving the shutter open longer. For the same effect, you can increase a counter’s time-constant. This is the duration of a single reading or “exposure.” All but the cheapest counters have a control knob providing a long or short time-constant, and automatically make “exposures” of the preset length. There are four major types of counters in general use now. Simple Geigier counter. Cheapest of available types, this light-duty instrument uses hearing-aid batteries and announces radioactivity by audible clicks. Models are priced from about $20 to $50. Rate-meter Geiger counter. This is the next step up. Resides registering endless clicks, it has a meter which shows at any moment the average counting rate, or strength of radiation. Rays come from uranium in irregular bursts, rather than an even flow; so an average count is a more accurate count, and the meter’s averaging action gives it to you. Rate-meter Geiger counters cost from about $70 to $350. Bigger tubes and costlier materials put these fine instruments in a class apart from their budget-priced cousins. A new development, the bismuth tube, greatly improves their efficiency and sensitivity. Single-tube rate-meter counters are simple to maintain; you can install a new sensitive element anywhere, a great advantage if you’re far out in the hills. Easy to use, they’re excellent for exploration, making grid surveys, and assaying radioactive ore. Available accessories will adapt some to take readings of the walls of deep drillholes and wells. Most important limitation is that, to detect faint radiation, you have to use long time-constants â€”too long for fast reconnaissance on foot, and impossibly long for effective use in a car or plane. Scintillation counter. Many times more efficient and sensitive than any single-tube Geiger counter, this instrument detects more rays, weaker rays and more distant rays. Hence it can use much shorter time-constants. Scintillators, as they are sometimes called, can be used for prospecting from the seat of a ear. The most sensitive ones also can be used in airplanes. The range of sensitivity depends largely on the size of the radiation-sensitive crystal. And since these artificially grown crystals are expensive, the crystal’s size is reflected by the instrument’s price tag. A counter with a l”-by-l” crystal can be had for $200; a 2″-by-2″ job costs $700. Scintillation counters have three drawbacks. They are not as mechanically rugged as good Geiger counters. They often work less well in hot weather. And only expert technicians, using special equipment, can service their sensitive elements. Multitube counter. Newest of major types, the rate-meter multitube Geiger counter achieves high sensitivity with from six to 60 Geiger tubes. It has the ruggedness of the single-tube Geiger counter; and the sensitivity and speedy operation, although not the compactness, of the scintillator. Multitube-counter models with 24 or 25 tubes, costing about $600, are the most popular. These versatile tools can be used for all kinds of prospectingâ€”shoe-leather, carbonic and airborne. â€¢ For dabbling in uranium hunting, you might as well choose a simple Geiger counter without a rate meter. You’ll find this low-priced instrument quite adequate for cheeking rocks around a farm â€”or for testing interesting formations, in passing, on occasional fishing trips. By placing the counter smack against every rock that looks promising, you can certainly tell whether or not it’s hot. This means extra footsteps, but it also means that your investment is in proportion to the time you can devote to looking for A-ore. While serious prospectors do not willingly settle for tools in this price bracket, valuable uranium finds have been made with these elementary but effective instruments. 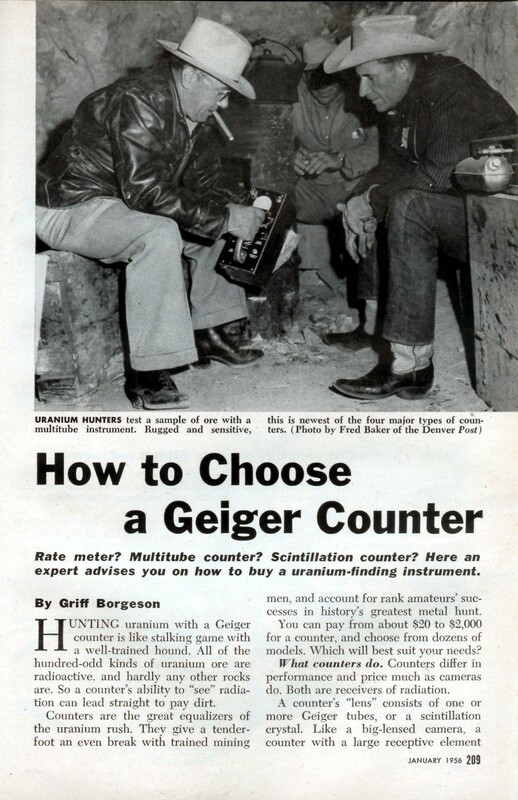 â€¢ A rate-meter Geiger counter is the right kind if you plan to hoof it back into the hills on a two-week vacation, or for more serious uranium hunting on foot. If there’s hot ore to be found, a thorough search with one of these counters will find it. After you’ve made a strike and start shipping ore, you’ll still need the trusty single-tube counter for pinpoint exploration of your property, for field assays and for grading ore shipments. Many professional “shoeleat her” prospectors use no other instrument, and wish for nothing better. â€¢ If you’re one of the lucky ones who can afford the very best, then a scintillator or a multitube counter is your dish. An investment of $500 to$Â§600 will get you an instrument thait is ideal for car-borne work and can be used for some airborne prospecting. Really powerful and effective airborne models start at about $1,000. Of course, either a multi-tube or scintillation counter is excellent for use on the ground. In short, buy the best instrument you can afford, that suits your needs; but don’t hunt quail with a cannon. Rent and try. Most dealers have instruments they rent by the day or week to occasional prospectors. If you’ve tentatively decided on the kind you need, but want to make sure that it’s the right one, ask a dealer about renting one for the weekend. After a tryout, you’ll be sure that you’re getting what you wantâ€” or you can change your mind, without taking a loss. About meter dials. The graduations on most rate-meter dials give readings in milliroentgens per hour, or mr/hr. Other dials indicate counts per minute or CPM. These are just two different ways of expressing the same thingâ€”radiation intensity. In almost all field work, it makes no difference which unit vou use. A counter’s dial can be graduated in “ax handles”; what’s important, is an increase in the reading. How sensitive? A practical measure of a counter’s sensitivity is the smallest difference in radiation intensity that you can read unmistakably on its scale. Because radiation from uranium is intermittent, every counter’s meter needle wavers back and forth; this wavering is worst, and most confusing, with the shortest time-constant setting. But the needles of some instruments swing only slightly and with a gentle pulse, while others gallop erratically all over the scale. Look for a steady needle, to get fast, accurate readings. You don’t have to judge a counter’s sensitivity solely by its maker’s enthusiastic claims. You can test it yourself with nothing more than a luminous-dial watch, which is radioactive, and a steel tape. Or you can use actual uranium ore, of which most prospecting equipment houses have samples for sale. Four different calibrated samples can be obtained for $2.50 from the New Brunswick Laboratory. U. S. Atomic Energy Commission, P. O. Box 150, New Brunswick, N.J. Using the same watch or ore sample each time that you test a counter, simply measure the distance at which it unmistakably registers the radiation. Naturally. & counter that picks up the sample at four feet is more sensitive than one that must be six inches closer before it can detect it. What time-constant? It takes a lot of costly sensitivity to provide both short time-constants and a non-galloping needle. Shop for an instrument with the steadiest needle you can get and a time-constant only as short as you need-three or five seconds for prospecting on foot, two seconds for carbonic work, no more than one-half second for airborne prospecting. Operating cost. Before deciding on a counter, find out how long its batteries last, and what they cost to replace. With the more expensive instruments, another item can run into moneyâ€”replacement of Geiger tubes, scintillation crystals, photomultiplier tubes. Judging quality. Though you may be no electronics expert, there are pretty reliable ways you can size up the handiwork of a counter’s maker. Have the chassis taken out of its caseâ€”this is quick and easyâ€”and take a long careful look at its workmanship. Sometimes a fancy futuristic case may conceal straggly wires, half-soldered connections, and tubes poorly protected against vibration and impact. A plain container may house fine circuitry. Buy performance and quality; a pretty package won’t find uranium. If you’re buying a scintillation counter, remember that you’re paying for crystal volume, which largely determines sensitivity. Makers’ figures call for a word of caution. 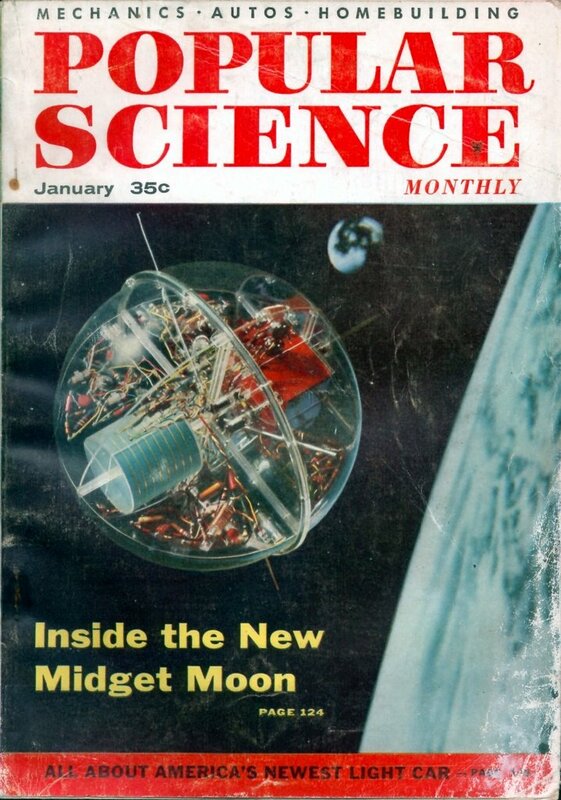 Formerly all scintillators had cylindrical crystals, and so you could be sure a “l”-by-l” crystal” was one inch in diameter and one inch long. In recent months, however, some counters have come on the market with rectangular crystals, usually advertised without giving their thickness. To illustrate how misleading this can be, a cylindrical 1″-by-1″ crystal has a volume of .785 cm in. ; but a rectangular l”-by-l” crystal, say 1/2″ thick, has a volume of only .500 cu. in. and therefore it cannot “see” as much radiation. So make sure of all the crystal’s dimensions, especially if a scintillator bears a “bargain” price tag. Here’s what important features do, and how they vary. Photo at right shows equipment of a single-tube rate-meter Geiger counter. Headphones and neon- count indicator detect radioactivity. Click in phones, flash of lamp, register a “count”; to measure radioactivity, you tally counts per minute. These are simplest counters’ only indicators. On counter at right, they supplement a meter. More sensitive counters omit them, as the counts would come too fast to tally. Rate meter detects and directly measures radioactivity, giving averagedâ€” and so highly accurateâ€”counting-rate reading. Sensitivity switch adapts scale of meter readings to strength of radiation. If “hot” area sends needle off scale, you change to less-sensitive range. Inexpensive rate-meter counters have two or three ranges; scintillators and multitube types, up to five. Time:-constant switch, with two settings (photo) or more, gives quick registering for fast, rough-and-dirty prospecting; slower response, for careful measurement. On-off switch may be combined with sensitivity switch, as in this model. Calibrating KNOB compensates for voltage drop of used batteries, on instruments from rate-meter Geiger counters up. Probe Detachable pROBE, found on some models, is a desirable feature. You can tie it to a stick, take ground leadings while walking upright. Lightweight probe is handier than whole counter for checking ore specimens. For a time during the 1950s searching for uranium deposits was like a latter day gold rush. The purchase of a geiger counter was not all that uncommon. I imagaine that more than a few wound up stashed in the back of a closet, much like today’s metal detectors. What do I need to find jewelry in my house? I’m not interested in radiation detection. dona parker: Then go to another blog. I’m not interested that you’re not interested. My son and I will be looking for dinosaur bones in the Wyoming desert in August. I understand they are very slightly radioactive there because the Uranium prospectors of the 1950’s found bones while hunting for ore. What sort of Geiger Counter would suit us? We’re just having a good little treasure hunt! I am going to Moab with my grandsons this fall. I would like to go out to Charlie Steen’s old mine and see if we can find some uranium ore. I do believe I will need a geiger counter in order to know that it is uranium ore. What would work for us? Don’t want to spend too much money as it is just sort of an educational and fun thing for us to do.